Moira ran thru the glen, giggling with joy because it was springtime. Nothing made her happier than seeing the flowers in bloom, hearing the birds chirping in the budding trees, smelling raindrops as they pitter-pattered on the leaves, and feeling the velvet touch of a rose petal. "What are you so happy about?" croaked Finlay, the frog. "It’s spring! Isn’t it pretty?" she laughed, bending down to sniff a tiny purple violet that was just beginning to open its petals. "I don’t like spring!" Finlay replied. "Why not? It’s the most beautiful time of year," Moira said. "I don’t like flowers. There are flowers everywhere," Finlay scowled. "Aren’t they lovely? My favorite is the lady slippers. They’re so pretty and pink." "Pink isn’t pretty to me. I like it better when it’s brown and no flowers are around," growled Finlay. "Well, I love flowers and I love pink and I’m not going to let a grumpy frog ruin this beautiful spring day for me," Moira said and ran towards a patch of bright yellow daffodils. She pulled one over and took a deep sniff out of the flowery trumpet. "Mmmm, that smells wonderful," she smiled. A bird began to chirp. Moira looked up into the tall trees surrounding her. "Sing me a song, pretty bird," she called. The bird began to tweet and warble. "I don’t like listening to birds sing," Finlay croaked. "What are you doing here?" Moira asked. "I am headed for the stream. You’re in my way!" he snarled. "Why don’t you stay and listen to the bird sing? It’s singing a lovely melody." "I don’t like birds singing and I don’t like flowers. Now, get out of my way!" Finlay hopped past Moira and headed for the stream. "Ignore him, little bird. He’s a grumpy frog. Sing me another song," she pleaded. She sat on a stone and listened to the bird until it flew off to gather sticks to build a nest with. "I love springtime. Oh look, there’s a rosebush." Moira ran through the tall grass and climbed up the thorny stem. "Nothing smells as pretty as a red rose in springtime. 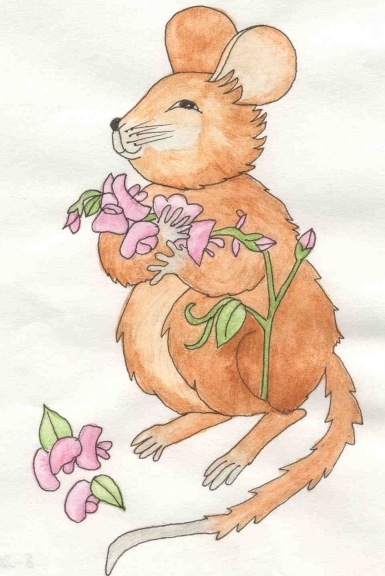 The petals are so soft," she said, rubbing them against her furry cheek. Finlay shook the rose bush and Moira tumbled to the ground, landing on top of a dandelion. "Why did you do that?" she asked, sitting up and rubbing her sore head. "I don’t like roses. I don’t like flowers at all," he answered. "You’re a grumpy frog. Why don’t you just go back to the stream and let me enjoy springtime," Moira pleaded. Just then it began to sprinkle. Raindrops fell from the puffy white clouds and splattered on the ground. "Rain! Let’s hide under this mushroom." Finlay didn’t move. He stood in the grass and let the raindrops kerplop on his head. "I like the rain. It makes my skin feel moist and refreshed. Maybe spring isn’t so bad after all," he croaked and hopped around the glen, laughing with joy. Moira watched him and started to giggle. "Even a grumpy frog like Finlay can find something wonderful about springtime," she said. When the rain stopped she picked up an armful of lady slippers and ran through the wildflowers. "I love spring!"